Tokyo: As Detroit’s Big Three auto makers flirt with collapse, punished for years of over-dependence on gas guzzlers, the future of the motor industry would seem to belong to energy-conscious rivals such as Japan’s Toyota Motor Corp. and Honda Motor Co. Ltd.
Not necessarily, say Japanese auto executives. “So far, the majority of cars still run on internal combustion engines," Kondo said. “Sure, there’s all kinds of hype about electric vehicles and hybrids and fuel-cell cars, but no one has the breakthrough technology to bring them into the mainstream." That may seem surprising coming from a company that has, with Toyota, been alone for most of the last decade in offering fuel-sipping, petrol-electric hybrids, seen as the next big thing to replace petrol and diesel-powered cars. To widen that lead, Honda is preparing to launch next spring its low-cost Insight, which chief executive Takeo Fukui has said would mark the true test for hybrid cars as a sustainable business after selling at a loss or at razor-thin margins so far. Kondo’s peer at Japan’s third-ranked Nissan Motor Co. Ltd agrees, saying the most difficult part is mass production—a feat first achieved 100 years ago by Henry Ford with the Model T.
“You can’t build next-generation cars cheaply enough without the volumes," Mitsuhiko Yamashita, Nissan’s executive vice-president in charge of research and development, said. “It’s thanks to Ford’s system that we can sell a lump of steel with all those functions at a relatively low price. The business model doesn’t work with vehicle technology alone." That should be music to the ears for companies such as General Motors Corp. that are bleeding cash but are not necessarily behind in developing next-generation cars. GM is betting on its Chevy Volt electric car to grab the industry crown back from Toyota and craft a new image as an auto maker capable of producing “green" cars. Nissan and French partner Renault SA hope to pull off something similar with their big push into electric cars. Although they have no prototype on the road, the partners are busy signing up municipal and national governments for tax incentives and other programmes to pave the way. But Nissan’s Yamashita acknowledged that no one knows who is leading the field in developing electric cars. Japan’s Mitsubishi Motors Corp. and Subaru-maker Fuji Heavy Industries Ltd are the only mass-market auto makers currently testing electric cars on the road—and still only a few dozen at that. 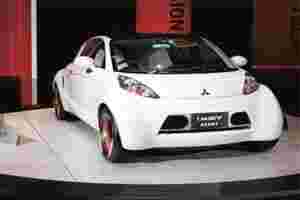 “It’s impossible to tell who’s got the competitive products because they’re all still in the lab," Yamashita said, adding that even Mitsubishi’s i-MiEV electric car, based on a gasoline-powered 660cc mini-car, was too expensive at an expected price of 2.5-3 million yen (Rs12.8-15.3 lakh). Japanese executives said the Detroit auto makers’ financial woes put GM, Ford Motor Co. and Chrysler Llc. at a big disadvantage, noting Nissan faced the same problem as it came close to bankruptcy in the late 1990s and skimped on research and development outlays. “Even if it’s just two or three years, once you fall behind the damage is big and it’s tough to close that gap," Yamashita said. “You really have to pick your battles and use resources wisely." Even then, coming up with a winning product is no small feat, and something the Detroit model has had little success with lately. “Detroit has some great technology, but there’s a big difference between the way technology is defined in the US and in Japan," said Shoichiro Irimajiri, former board member at Honda and US parts maker Delphi Corp., who is now co-chairman of Japanese supplier Asahi Tec Corp.
“In the US, it’s all about the invention, the patent," he said. “But in reality, there are many stages—innovation, application, and applying the technology in an actual, winning product with feedback from consumers. That’s where (the Americans) lose competitiveness." Honda’s Kondo said producing cars cheaply in itself would require a “revolutionary" technology akin to Ford’s invention in 1908 that made the automobile affordable for the masses. “These past three-four years have been a contest in the technological field," he said. “I think (the Volt) has some impressive technology behind it, but any product has to be desired by consumers. Those that can’t make products like that will be weeded out in this next stage of competition."